Question: How to generate a stripplot like this in Python or R? in R you can just make a scatter plot in something like ggplot2. You could use facets per gene. Another example is here. I don't think the author used facet to draw this. It seems that it used a special version of jitter (ordered). 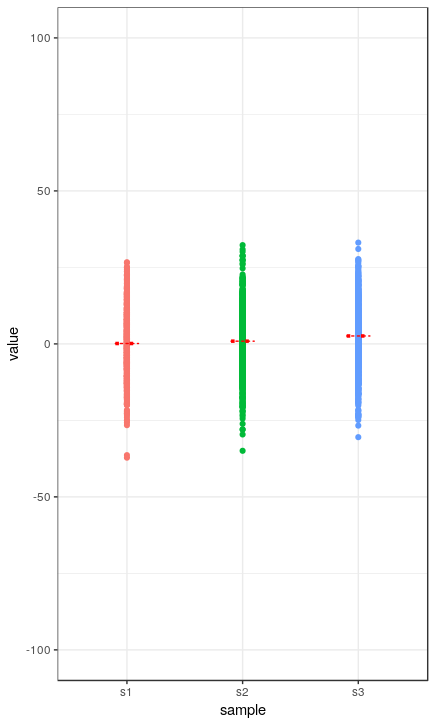 do a box plot and jitter. Do not draw box plot boundaries and let median line be there. usually, jitter in boxplot only generates some noise in x-axis to avoid overlapping. I don't know how to do it in an ordered manner. Can you show some code snippet? Thank you. some thing like this ? How to upload python modules into RMarkdown document? How to further process inSilicoMerging data in R?